Rocket Stoves are very efficient wood-burning devices that generally use a J shape design for the combustion unit to achieve high temperatures and clean burn. The heat generated can be piped through thermal mass, such as an earthen bench which can serve as a “thermal battery”, storing the heat while creating warmth and comfort. This article features four of the mass stoves that are on-site at Strawbale Studio 1 hour north of Detroit. 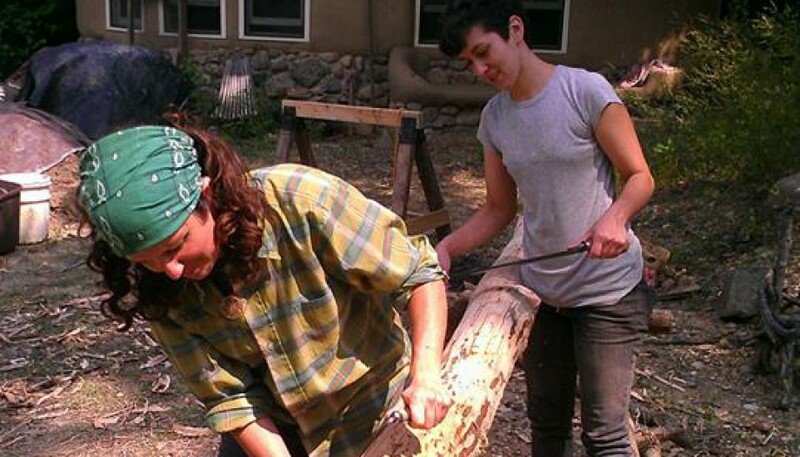 Attend a Rocket Stove & Earth Oven Class this year ! Come for a scheduled tour of the buildings & grounds. Or partipate in a one month internship or wwoof program ! 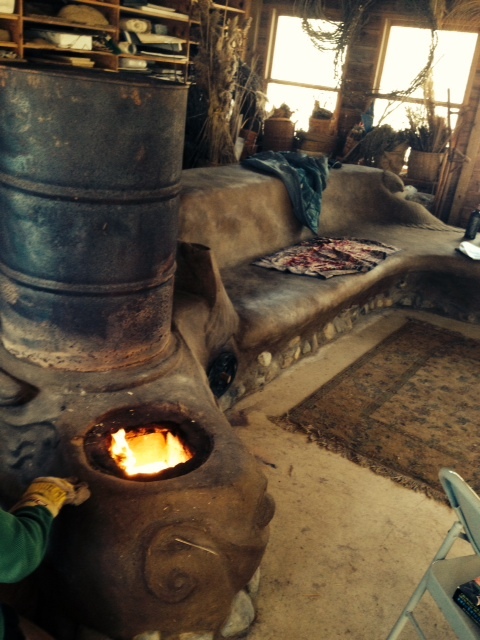 There are several Rocket Stoves on site at the Strawbale Studio: The Rocket Stove Heated Bench ~ in the Red Shed pole barn, was constructed by many hands. It is uniquely sculpted with animal shapes ~ a turtle, a hawk with wings creating the sides of the seating area, and other beings woven into the design of the heater: whale, mouse, rabbit, frog, salamander, fish. 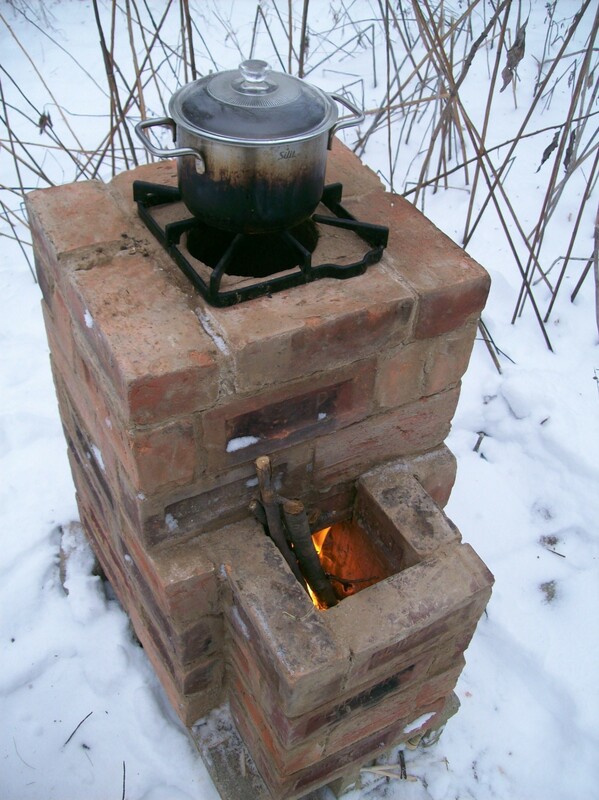 The Outdoor Rocket Cooker is a basic Rocket Stove with a short feed tube where the wood goes, a horizontal burn tunnel, and a vertical chimney. The air is drawn down the short feed tube, then rise up the chimney to provide heat to cook food. It is considered a down-draft stove, and it burns cleanly, without smoke, using only sticks ~ once the fire is going. Easy to construct, this stove has a 6″ stove pipe inside, with insulation (purlite or ashes) between the pipe and the bricks. This makes the fire hotter, burning more completely (cleanly). We used an earthen mortar between the bricks ~ a clay/sand subsoil mix put through an 1/8th inch screen or window screen. Water is added until this mix is like “mousse” – sort of thick & fluffy, spreadable. The bricks are soaked, then the earth mortar is thinly applied. The top layer needs re-mortaring every year or. Cement mortar would be more weather-resistant. The top of the stove is protected, when not in use, with a 3 x 3′ piece of plywood. A roof over it would be lovely. 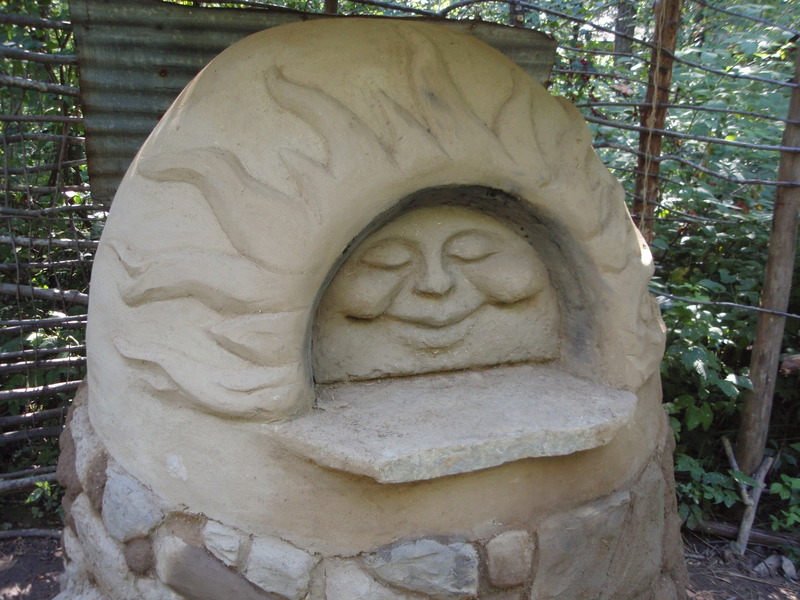 The Smiling Sun Earth Oven is constructed primarily of clay / sand subsoil. This traditional type of oven has been used throughout the world, over time, to bake anything you could bake in an oven. It is of course beloved as a Pizza Oven ! This oven has a suspended metal roof which protects it from the elements. and a fieldstone foundation sitting on 8 inches of gravel below the ground level (grade). Rumford Fireplaces are quite efficient compared to a regular fireplace. Invented by Count Rumford during the time of Benjamin Franklin, this stove design features a shallow fire box area, with deeply slanted side which reflect the heat and radiate it out into the room. Fires are often burned with the sticks placed vertically against the back wall. 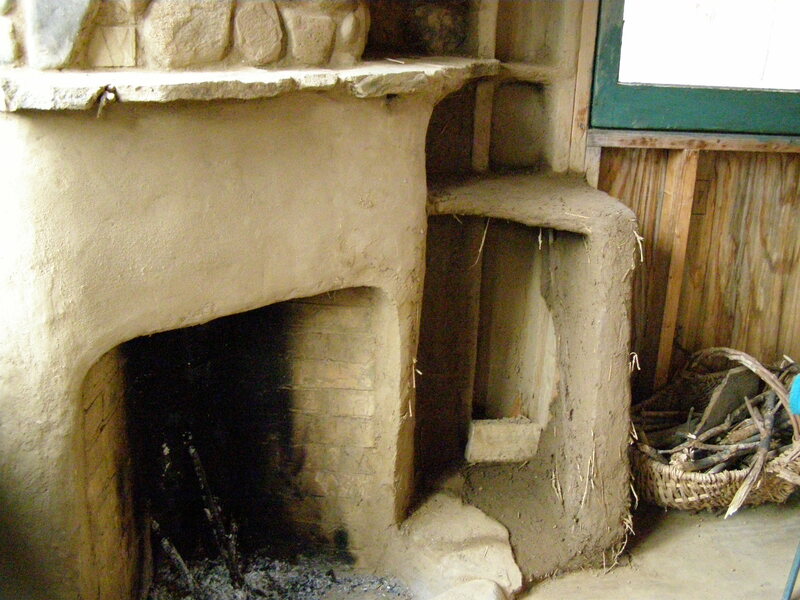 The Rumford Cabin Fireplace is constructed almost entirely of Cob (an earth mixture of about 1/4 clay / 3/4 sand) and uses manufactured bricks only on the surface of the firebox. The newest Rumford Cob Wall Fireplace is built into a Cob Garden Wall. It uses only cob (no bricks) except for the floor of the fireplace. An 8″ metal pipe directs the flue gasses out of the cob and an insulated pipe takes it through the living roof. Other cooking and heating devices on site are The Solar Cooker, The Haybox Insulative Cooker, several small metal “Pocket Rockets“. A wonderful book ~ Rocket Mass Heaters, now in its third edition, is the fruit of a collaboration between inventor Ianto Evans and creative publisher Leslie Jackson – with the hands-on assistance of two professed pyromaniacs: Kirk “Donkey” Mobert and Ernie Wisner. Ianto was me natural building teacher and mentor. Kirk and I co-lead a 2 week cob construction workshop in Oregon. These are my peeps, along with Ernie & Erica, Max & Eva Edelson and Kiko Denzer. Complete Step-by-Step Construction, Maintenance and Troubleshooting by Erica Wisner & Ernie Wisner . These folks are experienced! Portland Code for Rocket Stoves. Great Code article, see bottom section on “Scope”, use this to interface with code officials. Video on Code by Ernie & Erica. (5 min) Getting a Permit for Rocket Stoves. Codes for Stove, Heaters, Ovens. Portland Code for Rocket Stoves. Great Code article, see bottom section on “Scope”, use this to interface with code officials. Designs for Rocket Heaters & Cookers From Eva Edleson of Fire Speaking. Kiko Denser‘s website page on Rocket Mass Heaters and Bell Design. This link also has further resources & link on Rocket Stoves ! Masonry Heater added to Woodstove. How fire works . Tips on burning wood.